After a retinal degenerative disease stole pilot Jim Platzer’s eyesight, one of his greatest fears would be that he could never fly again. After working closely with a certified flight instructor, Jim was able to take back the controls and performs the impossible feat of landing blind. In addition to flying, Jim has a passion for cars, but had to give up his seat behind the wheel shortly after his sight started to dwindle at the age of 26. He stopped driving in 1995 and relied solely on his wife to guide him through life. His life was changed once again after an intensive course that placed Jim with his first guide dog. He regained his independence and was led out of the darkness. He then decided to live life according to what he could do and not what he couldn’t. Taking this epiphany one step further, Jim went into business helping others. His motivational speaking created such a reputation that he caught the interest of Audi who invited him to tour the U.S. as a the keynote speaker to their employees and dealership personnel in an effort to promote the importance of providing a superior customer service experience. His relationship with Audi became symbiotic when they allowed him behind the wheel of an R8 supercar, guided by a professional driver. After 17 years, he was able to drive once again and more than that he poignantly demonstrated the concept of turning goals into reality. Later, Audi offered to let him drive a Lamborghini and that’s when it dawned on Jim, that if he could fly along the ground, he could surely fly in the air. A lifelong pilot, Jim decided to use his love of aviation as a tool to demonstrate to others the ability of the human spirit to overcome perceived disabilities. This flight would be a clear illustration of a person’s capacity to set and attain goals no matter how unlikely they are to succeed. After so many years removed from aviation, Jim had lost all contact in the industry. He boldly picked up the phone and began dialing starting with the most familiar Smith Field where he first learned to fly. He got in touch with Joel Pierce from Sweet Aviation and after a little convincing, a deal was struck. Plans were hatched to fly with a blind pilot and Jim’s training began. 40 years after his first flight at the age of 21 on very same airfield in Ft. Wayne, Indian, Jim powers up the Cirrus airplane and proceeds to make three takeoffs and landings with a flight instructor guiding him verbally and ready to take the controls should the need arise. The Cirrus isn’t exactly a beginners plane either. Its considered high performance and everything happens a little faster when flying it. The big bright glass cockpit doesn’t do Jim much good either since he’s literally flying by the seat of his pants. Even though the Cirrus has become the best selling single engine personal plane in the world, its generally not used as a trainer. Cirrus has been fairly successful clearing up a bad reputation after a rash of incidents threatened to smear the glowing praise for the airplane. It seemed many overpaid, under trained pilots would take to the controls and find themselves in a situation over their head. More controversy surrounded the use of the whole aircraft parachute system as a crutch for proper aviating. None of that seems to bother Jim as he expertly handles the plane while following directions, calling out for speeds and, in truth, lands a Cirrus better than some pilot’s I know with 20/20 vision. When Jim describes his time behind the controls there are two things he’ll make perfectly clear; first, it’s not simply about a blind guy flying a plane but a demonstration of our ability to achieve goals. 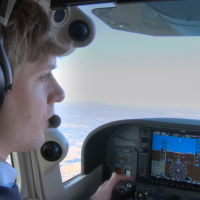 Second, he’s quick to give his flight instructor Joel all the credit for taking a risk training a blind student. Joel not only proves his value going out on a limb with Jim, but his 1,000s of hours experience enables him to adapt his training techniques to accommodate a student’s strengths and weaknesses. Through the months of training prior to the first landing, Joel was able to make suggestions to improve Jim’s technique, including transitioning from the basic trainer Cessna 172 into the higher performance Cirrus SR20. It might seem odd to move to something faster, but it turned into the key to his success. Jim admits that while things do happen faster in the Cirrus, the side stick and center throttle are more intuitive to his abilities compared to the steering wheel like controls of the Cessna. He also found its faster rate of response and better handling capabilities were easier for him to maneuver. Jim’s time in the air has been such a success to him personally that he plans to continue flying and look forward to attacking new challenges with more horsepower as he prepares to step up into the even faster Cirrus SR22 GTS. He’s found a good fit with flying Cirrus aircraft and hopes to keep that relationship an active part of his life. I think this demonstration proves Jim a worthy motivational speaker who actually practices what he teaches and his message certainly relates to anyone with the human condition.